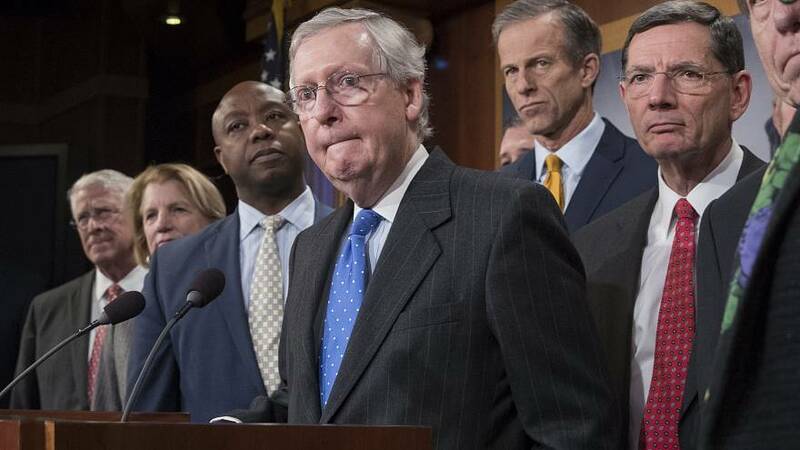 WASHINGTON — The Senate voted along party lines after midnight Tuesday to pass a sweeping $1.5 trillion tax bill that slashes tax rates for corporations, provides new breaks for private businesses and reorganizes the individual tax code. The House approved the bill earlier Tuesday but will have to vote again on Wednesday. Democrats in the Senate persuaded the chamber's parliamentarian that several minor provisions in the House bill violated Senate rules, forcing the House into an embarrassing second vote. One of those provisions would allow 529 savings accounts, which are now used for college tuition, to help finance home schooling. Another would exempt a small tuition-free college in Kentucky from a new tax on endowments. The Republican bill was initially approved on a 227-203 vote in the House earlier Tuesday, with no Democrats supporting it. Twelve Republicans also voted against the measure. With Vice President Mike Pence presiding over the chamber and Treasury Secretary Steve Mnuchin on hand, the Senate then voted 51-48 in favor of the bill. The Senate's bill will go back to the House for a final vote, after which President Donald Trump could sign the package, dubbed the Tax Cuts And Jobs Act, into law before week's end. It would be his first significant legislative accomplishment and the biggest tax overhaul in a generation. Trump touted the bill's passage on Twitter and said he would hold a news conference at 1 p.m. ET on Wednesday pending final approval in the House. House Speaker Paul Ryan, R-Wis., lauded the bill during an interview with NBC's "Today," Wednesday morning, reiterating the GOP's claim that cutting the corporate tax rate would allow American companies to create new jobs with the savings and rejecting criticism that companies would merely pocket the savings. At the White House, Press Secretary Sarah Huckabee Sanders, anticipating final passage of the bill in the Senate on Tuesday night, said, "The president will have delivered the most significant tax cut in the history of the nation." "We will look forward to signing it, hopefully in the next couple days," she added. Sanders also defended claims by the president — which tax experts say are likely wrong — that his own taxes would go up under the legislation, saying that the bill "certainly, on the personal side, could cost the president a lot of money." The ultra-rich fare well in the tax bill overall. An analysis by the non-partisan Tax Policy Center found that 83 percent of households in the top 0.1 percent would receive a tax break in 2018 with an average benefit of $193,380. For the middle 20 percent of earners, the average tax cut would be $930. Over half the bill's total benefits would go to the top 10 percent of earners. "Republicans will rue the day that they pass this tax bill because it's so unfair to the middle class," Senate Minority Leader Chuck Schumer, D-N.Y., said shortly before the House vote. "It so blows a hole in our deficit, it so threatens Social Security, Medicare and Medicaid. They will rue the day." "I don't think we've done a good job messaging," Rep. Greg Walden, R-Ore., told reporters ahead of the vote. "I don't think we've gotten out there the specifics and the final bill has only come together in the last week or so." "I think that is going to change, we will see once the economy continues to roar and people begin to see more coming in their paycheck," Short said on MSNBC.